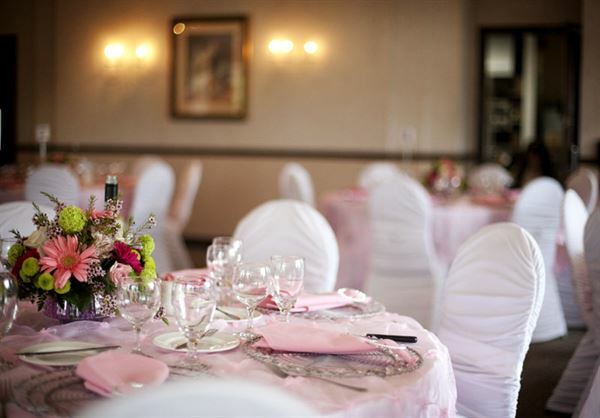 Established in 1992, Harmony Creek Golf Centre features a picturesque banquet hall perfect for your wedding, tournament, private or corporate function. We offer a wide spectrum of menus which will suit your budget and satisfy your attendee’s taste buds. We pride ourselves in using only the finest ingredients & highest quality foods. Harmony Hall features seating for up to 150 people and is fully licensed by the AGCO. Allow us to create an unforgettable experience with our delectable cuisine & excellence in service which is second to none. Harmony Creek also features an 18 hole executive golf course, a driving range & mini putt that is open to the public. Contact us today for a tour of the venue and free estimate. All food and beverage services are subject to 13% HST and 15% Service Charge. No outside food or beverages (other than the specialty cake) are allowed into the facility. All our Wedding Packages Include: ~ Chilled Non-alcoholic Fruit Punch bowl on arrival ~ Chilled Champagne Punch bowl on arrival ~ Attendant circulated assorted hot hors d’oeuvres platters on arrival ~ Your choice of full service, plated dinner menu ~ Complimentary late night service of your Wedding Cake ~ Late night coffee & tea station ~ Menu tasting for the Bride & Groom ~ Green fees & a power cart for your enjoyment! ~ Tax & service charge included Gold Package A $65.00 per person As listed above plus: - Two 750 ml bottles of house wine per table of 8 persons - One glass of sparkling wine per person for toast Gold Package B $80.00 per person Everything listed in Gold Package A plus: - Decorated backdrop for behind the head table - Decorated head table - Cake table & chair covers Please review the attached Wedding Package brochure for complete details and additional options. A minimum of 50 persons is required to reserve entire hall. If less than 50 persons attend, a hall fee in the amount of $450.00 + 13% HST will apply. No outside food or beverages (other than the specialty cake) are allowed into the facility. All our Wedding Packages Include: ~ Chilled Non-alcoholic Fruit Punch bowl on arrival ~ Chilled Champagne Punch bowl on arrival ~ Attendant circulated assorted hot hors d’oeuvres platters on arrival ~ Your choice of full service, plated dinner menu ~ Complimentary late night service of your Wedding Cake ~ Late night coffee & tea station ~ Menu tasting for the Bride & Groom ~ Green fees & a power cart for your enjoyment! ~ Tax & service charge included Platinum Package A $99.00 per person As listed above plus: - Two 750 ml bottles of house wine per table of 8 persons - One glass of sparkling wine per person for toast - 5 hours full service standard host bar Platinum Package B $114.00 per person Everything listed in Platinum Package A plus: - Decorated backdrop for behind the head table - Decorated head table - Cake table & chair covers Please review the attached Wedding Package brochure for complete details and additional options. All our Wedding Packages Include: ~ Chilled Non-alcoholic Fruit Punch bowl on arrival ~ Chilled Champagne Punch bowl on arrival ~ Attendant circulated assorted hot hors d’oeuvres platters on arrival ~ Your choice of full service, plated dinner menu ~ Complimentary late night service of your Wedding Cake ~ Late night coffee & tea station ~ Menu tasting for the Bride & Groom ~ Green fees & a power cart for your enjoyment! ~ Tax & service charge included Diamond Package A $109.00 per person As listed above plus: - Two 750 ml bottles of house wine per table of 8 persons - One glass of sparkling wine per person for toast - 5 hours full service premium host bar Diamond Package B $124.00 per person Everything listed in Diamond Package A plus: - Decorated backdrop for behind the head table - Decorated head table - Cake table & chair covers Please review the attached Wedding Package brochure for complete details and additional options. We were very please with the whole experience. Everyone was tremendously helpful and accommodating. I would highly recommend this venue for seminars and conferences.